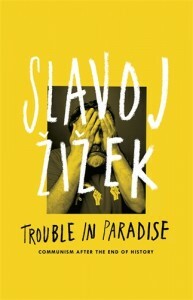 A review of Trouble in Paradise (Allen Lane, 2014) and Absolute Recoil (Verso, 2014) by Slavoj Žižek. Slavoj Zizek is a strange creature: a ‘famous’ European philosopher who loves to discuss popular films and music, and an atheist who claims to be more Christian than Christians. Zizek is a Marxist critic of the injustices and imbalances of contemporary capitalism, and a follower of theorist and psychoanalyst Jacques Lacan. Over the years he has been incorporating more and more theology into his philosophy, particularly as it relates to the Apostle Paul. Unlike many of his contemporaries, Zizek takes Christianity seriously, even if he claims its ethical core while rejecting conventional ideas of God and the afterlife. But because he takes Christianity seriously, Christians may also want to take him seriously. Sometimes it is difficult to know what on earth he is talking about. At other times, as many readers have noted, his train of thought takes many detours. Yet with Zizek, the sidetracks are the journey. Like a toddler, he applies his concentration to whatever happens to interest him at the moment. He is a compulsive writer, and something of a self-plagiaristic one, as these two new books indicate. Much of the material in the more accessible Trouble in Paradise is reworked and expanded in the more heavily philosophical and challenging (in both good and bad ways) Absolute Recoil. He also continues to hammer the same themes, especially his particular brand of dialectic materialism. But, then, he has an excuse—like Kierkegaard, he protests that radicals tend to repeat themselves until they are listened to. The off-colour jokes, the rhetorical questions, the references to popular films usually thought unworthy of serious analysis: these have all become standard for his books. But beyond making him seem hip, they help as a way into his theorising, which tends to be jargon-heavy and at times counter-intuitive. Indeed, Zizek is a big fan of the Chestertonian paradox. There is a danger of this becoming overdone (and it can, paradoxically, become predictable that he will argue against the conventional wisdom). But much of the time it illuminates the times we live in. And it has some affinity with Christian notion—that to lose one’s life is to gain it, for instance. Zizek is a fan of philosopher Georg Hegel, and much of Zizek’s recent work is an attempt to argue for his own version of dialectic materialism. And here again, Zizek’s work present some parallels with Christian doctrine. When prompted by Pilate, Jesus argued that his kingdom was not of this world, which meant he did not associate himself with the ruling parties or their underground opposition, the zealots. But Jesus’ kingdom is not apolitical (as is often assumed)—it simply rejects the conventional way of politics as practised by left and right, offering a new way of loving self-sacrifice rather than power as the basis for society. So too Zizek, borrowing heavily from the New Testament, argues for a new way that moves beyond modern capitalism as endorsed by both left and right. Post-GFC, much of his writing is concerned with the failures of modern capitalism: failures that should be evident enough to Christians also, such as the fact that the GFC caused misery for many low-income earners, while the bankers who created the mess, and the system they operated under, were largely protected. Zizek’s picture of this system is like one of those rocking boulders that become tourist attractions in national parks – it shifts easily back and forth, but essentially remains in place. Zizek looks for a new way of levering the problem. In similar fashion, the disciples realised that while Jesus’ death looked like failure within their understanding of the system, his resurrection opened up a whole new way of operating. Zizek returns again and again to what he terms the subversive core of Christianity, which fits in with his political thinking, and he argues that his interpretation is closer to the spirit of early Christianity than much of what the Church has done since. There is nothing revelatory about this. The first Christians were harassed for supposedly subverting the Roman authorities. And he is not the first to portray Jesus as a subversive figure while rejecting the incarnation or theism or the conservatism of the Church. There are even precedents within the Church for focussing on the material aspects of Christianity – the early church members were labelled as ‘atheists’ for rejecting much of their society’s supernaturalism and for ignoring religious ritual in favour of helping orphans and widows. But that is not the whole story. While one might applaud Zizek’s concern, one needn’t concur that modernity simply rules out traditional Christian conceptions of God. The disciples didn’t just decide sometime after Jesus’ death that his ministry to the outcasts had something going for it after all. They were shocked into their subversive ministry by being witnesses to Jesus’ resurrection and by being animated by the Spirit at Pentecost. Anyone who wants to divorce Christianity’s subversive core from its historical insistence that a personal God exists has to contend with this mystery. Nick Mattiske blogs on books at Coburg Review of Books. Is happiness in the Bible?